Shido Nakamura and Yuko Takeuchi (left) cuddle, and (right) check out the flowers in Be With You. The Skinny: A well-told romance about a woman returning from the grave to visit her husband and her six-year-old son. The film requires the viewer to suspend their disbelief to be sure, but not necessarily in terms of its far-out premise. Even so, Be With You is a terrific little film. Review by Calvin McMillin: Unlike most traditional romances, Be With You offers up an intriguing, possibly supernatural premise - a deceased love returning from beyond the grave. It may sound like a pitch for a horror movie, but Nobuhiro Doi's masterfully told romance is anything but scary. 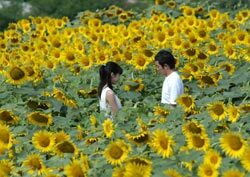 A box office hit in Japan and elsewhere, Be With You is a rousing crowd pleaser, although not without its fair share of problems. The film revolves around a widower named Takumi (Shido Nakamura) who lives in the country with his six-year-old son Yuji (Akashi Takei). Both are mourning the loss of Mio (Yuko Takeuchi), beloved wife and mother. In the wake of her death, Takumi and Yuji have forged an odd, yet somehow functional relationship; they act almost as if they were abandoned children forced to take care of each other rather than actual father and son. And as if Mio's death wasn't enough, it seems Takumi suffers from a medical condition (Ah, another melodramatic staple!) that affects his motor skills. As a result, Takumi must avoid crowds and live like a veritable recluse. Yuji is disappointed that Takumi can't do the things that most fathers can, but turns out to be amazingly understanding about his father's condition. Besides, Yuji has bigger things to prepare for - like his mother's possible return. Strange as it may sound, Mio made a promise on her deathbed that she would return to Yuji and Takumi when the rainy season comes. Of course, Takumi is skeptical of his wife's promise, but refuses to put a damper on his son's excitement. It's clear that Takumi, too, hopes that her dying words come true. On the first anniversary of her death, Takumi and Yuji wander in the woods near their house and end up meeting a woman who is the spitting image of Mio. Strangely, the woman possesses no memory of who she is or how she got there. Rather than question such a providential turn of events, father and son embrace the moment and try to make the most of her return. Tentatively, their family life resumes, as Mio begins to adjust to her role as wife and mother, re-energizing the family dynamic in a way that brings happiness to all parties involved. In the meantime, Takumi tries to fill in the blanks for Mio about how they fell in love. Their backstory is told from his perspective, as the film flashes back to their high school days. However, his version of events makes it clear that Takumi never became aware of Mio's true feelings at the time, a fact that will come into play later in the narrative. But underlying all this happiness is the question of how long this reunion will last. It seems that while she was alive, Mio buried a time capsule, one that holds the key to her startling reappearance. Learning the truth of the situation, Mio realizes that her days are numbered and takes steps to ensure that Takumi and Yuji are well-taken care of (and are able to take care of themselves) when she finally departs this earthly plane. As the rainy season's end approaches, all three must prepare for her eventual, poignant departure. Although I found Be With You to be an engaging experience from start to finish, it's not hard to see how some might find fault with the film. As with most romances, it could be accused of being a bit too sentimental and manipulative in execution. Furthermore, a feminist critique might focus on how Mio's importance to the family seems to be directly related to her ability to cook, clean, and basically take care of Yuji and Takumi. But while I can acknowledge that these issues are present within the film itself, I found no such problems with Be With You. The film possesses a simple, irresistible charm, and it's clear that its main strength lies in the beautiful Yuko Takeuchi. She's fantastic in the role of Mio, imbuing her character with a sense of strength, grace, and warmth that makes her utterly convincing as the glue that holds the family together. The film also benefits from the performance of child actor Akashi Takei, who plays Yuji alternatively as a young boy wise beyond his years, yet very much as the cute child who wants nothing more than to be reunited with his mother. If there is one complaint that I would lodge with the filmmakers, it would have to be on the issue of the suspension of disbelief. Strangely, I didn't find it hard to buy into the film's supernatural/sci-fi premise at all, but instead found it more difficult to buy into the fact that Mio and Takumi would ever be a compatible couple in the first place. The two leads share a certain kind of chemistry, but even though it's obvious why any guy in the world would fall in love with a girl like Mio, it's near-unfathomable to me how Mio would be interested in a guy like Takumi. At times, Shido Nakamura plays Takumi as an overgrown man-child. His condition is supposed to make him an outcast of sorts to begin with, but it's odd that when Takumi is reunited with Mio, he appears self-conscious and uncomfortable around her. You would think that if this is the woman who "completes him" (pardon the Jerry Maguire reference), then he would come out of his shell in her presence. Certainly, his spirits are lifted by her return, but he still acts a little strange. In fairness to the filmmakers, perhaps it's a double-edged sword: if Takumi seems too capable, then Mio's importance to their lives is lessened. But if he appears a too off-kilter, then her reasons for falling in love with him seem wholly unbelievable. Truth be told, the film does offer an explanation of sorts (which I won't reveal here) for their union, but trying to make sense of it involves certain violations of the time-space continuum that might make your head explode. Perhaps it would be better just to accept their love "as is" and go from there.